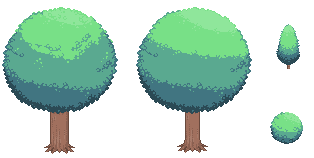 I don't really know how to go to about making trees but here is what I came up with. shapes are a bit too regular. it would be pretty amazing to prune a large tree to such a perfect sphere. try adding random clumps etc that suggest a natural branch structure underneath. that lightest green looks odd. quite a big change between 2nd darkest and 2nd lightest green which u can use to ur advantage if u texture well. the cool colours of leaves look OK if thats what ur going for, though its more typical to ramp towards yellow where more sunlight hits. if ur colour picker has HSB mode, check the values with the eyedropper and u can make a nicer ramp quite easily then. on the trunk u can add shadow, increase contrast, have some more fun with bigger roots etc (middle root is out of perspective too). Simple shapes can be ok if they fit the context (are these for a game?). The smaller ones in particular could have enough detail for most uses, although the specific pixeling of that detail looks a bit random. Agree with decroded about warmer light tones. Shading isn't great either. For one thing, the trunk is impossibly brighter than the darkest leaves; also you used unrealistic, evenly spaced gradients which are not specific to any kind of light source. Notice how some large areas are almost evenly lit while others change a lot in a short distance. This is something that restricted palettes are good at: use it to your advantage! This is just a generic shading tuto for a sphere in harsh light; according to your intended light source and tree texture, the result might be entirely different but you've got to think about how a specific light works on a specific object, with help from references or IRL experiments if need be. You've got the basic idea. break it up more.